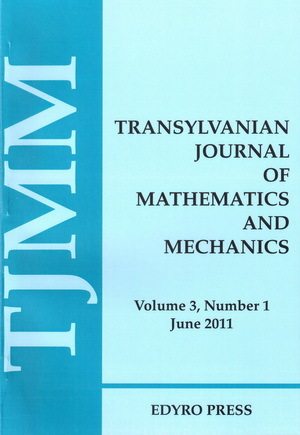 TJMM publishes high quality original research papers and survey articles in all areas of mathematics and mechanics. It will also occasionally publish, as special issues, proceedings of international conferences (co)-organized by the Department of Mathematics and Computer Science, The University of Petroşani. In particular, TJMM publishes special issues dedicated to the work of some distinguished mathematicians and to their fields of research. All published papers are written in English. All papers are peer-reviewed. Decision on acceptance of papers will be made by the Editorial Board. There is no fee for the published papers - to change, see below. For subscriptions, exchange proposals and back issues please contact the Editor-in-Chief, Managing Editor or Editorial Secretary. Frequency: Published in one volume (with two issues) each year in print and electronic version. Starting with 2015, free of charge published manuscripts should have no more than 10 pages using the journal's template. Only invited manuscripts are allowed to have 12-14 pages. Any other manuscript exceeding 10 pages will be charged with a fee of 10 EUR for each additional page.